BRB. Working through some emotions after hearing that Once Upon a Time didn't even approach a single original cast member from Frozen to appear in the upcoming 11-episode storyline arc. It's just…Hello?! Kristen Bell! Idina Menzel! Jonathan Groff! How could you not be banging down their doors to play the characters they originated, especially when Kristen herself said she'd be into it? As you can see in the video below, Once Upon a Time's big bosses, Eddie Kitsis and Adam Horowitz, revealed that they didn't approach any of the stars from the Frozen movie to play Anna, Elsa, Kristoff of Hans on their show. PHOTOS: Check out the officlal pics of Frozen on OUAT! But…In all fairness...They did have a good reason. 1. Josh Dallas is the CUTEST. DAD. EVER. OK, that has nothing to do with Frozen even in the slightest. But please click on the video below for indisputable proof. Hearing Josh talk about baby Oliver and poop and Ginnifer Goodwin as a mom is guaranteed to make your ovaries swoon. (That doesn't happen.) You have been warned! Why Josh Dallas Says His Newborn Is His "Soulmate"
2. None of the Original Frozen Cast Was Approached to Guest Star: "We did not [go after them]," executive producer Eddie Kitsis told me. "Those actors were so amazing," exec producer Adam Horowitz explained, "but it's their own thing. They should have their thing and what we're doing is separate from the movie. We're not trying to do a sequel to Frozen. We're trying to do our Once Upon a Time version of it and create our own little world and hope that fans of Frozen and fans of Once can enjoy it." "We're such fans of Idina and Kristen," Eddie added. "We are such fans." OK, we'll let this one slide…Just because the recently revealed cast photos do look ridiculously cool and spot on. 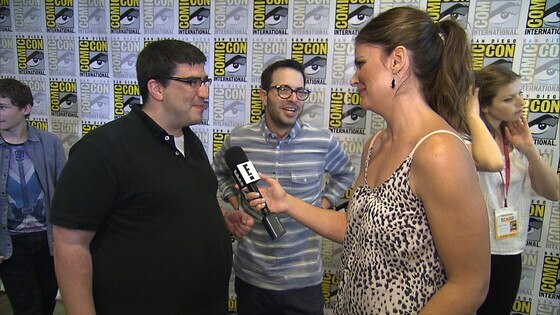 "OUAT" Creators Tease "Frozen" Cross-Over Surprises! 3. Anna and Elsa Are the First Characters WITHOUT a Twist: "Instead of trying to do a twist on the characters and changing them," executive producer Eddie Horowitz explains, "we really wanted to make the characters like what they were in the movie, honor them and who they are and where they came from in the movie, but find a twist in how they interconnect into our Once Upon a Time world…For us, it's fun to find out what happens when Anna meets Rumpelstiltskin? What happens when the most hopeful person in the world meets the darkest person in the world? Lana Parrilla Plots Revenge on "Once Upon a Time"
4. Anna and Elsa Are "Identical" to the Movie: "I know that when I saw Georgina [Haig] dressed as Elsa," recalls Lana Parilla (Regina), "and I met the two actresses when they were in costume, I felt like I was sitting in the movie theater watching the movie. They are identical to the characters in the movie. They look exactly like the animated versions. It's mind-blowing!" 5. Anna and Elsa Are Making Friends. Sounds to me like Anna and Charming will have some interaction, as well Regina and Elsa. "Regina's used to being alone as is Elsa," Lana teases. "There's that similarity." And as you can see in the video above, Josh is pretty much beginning to say that he's going something going on with Anna. 6. The Original OUAT Cast Was Just as Nervous as Fans About the Frozen Twist: "It's brave to take on such new characters," Jennifer Morrison told me. "We're not talking about fairytale characters that we knew from 10 years or 20 years ago…I, as an audience member of the scripts, was totally fascinated to see were they going to be our friends, were they going to be our villains, was the ice going to be a problem, was it not going to be a problem, so I think a lot of the questions that the fans have are questions that we all had. We are now discovering one script at a time the way they've put them into our world and it's amazing to see how it feels like they've always been there. They've done it so seamlessly that it feels like, to us, Anna and Elsa have always been a part of our world." 7. The Cast Spilled More Scoop—and Were Just the Best! Check out the video interviews above and below! 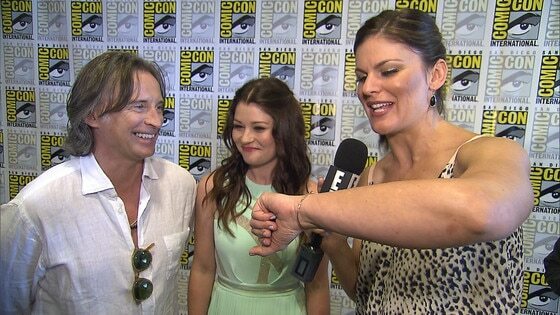 Emilie de Ravin and Robert Carlyle Married on "OUAT"
What do you think of Frozen not approaching the original stars? Hit the comments! PHOTOS: See the Frozen cast on Once Upon a Time!